This year for Lent I'm spending some focused time in the book of Psalms. This collection of poetic, prayerful hymns has been central to Jewish and Christian spiritual devotion for thousands of years. They inform modern praise songs and ancient hymns, and the language we use when we pray to God and when we theologize about God. Both the New Testament in general and Jesus in particular quote the psalms more than any other book. Written centuries before Jesus wandered the dusty paths of Palestine, it is impossible to imagine what Christianity would be like without these 150 Hebrew poems and the depth of reflection, and the wisdom and the spiritual and human and divine insight that they contain. But in many of our churches they are underused and under appreciated, misunderstood and neglected. Which leads me to wonder: what are we missing? I want to encourage you to join me in reading a psalm a day for the remainder of Lent this year. I'll post the whole reading plan here in a printable format; you can find the readings for just the remainder of the season below. I should have shared this much earlier, but it is never too late to jump in. Imagine the depth and power you might experience if you just prayerfully read one psalm a day between now and Easter! When I'm in the car I love to listen to audio books. It makes me feel productive on my commute or whenever I'm out and about. While it's not great for every type of book, it has enabled me to 'read' scores of books that I otherwise would not have been able to. 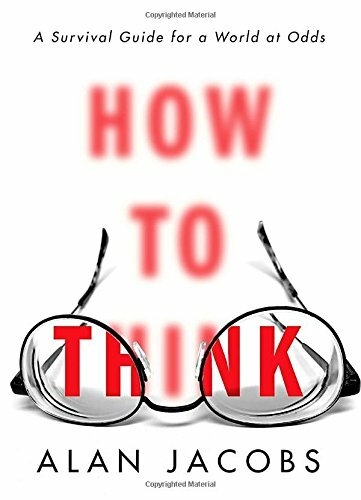 One of the best books I recently finished was Baylor University professor Alan Jacobs' new (and topical) book, How to Think: A Survival Guide for a World at Odds. Much of the news we read and watch, the soundbites our political leaders spout, the memes on our social media feeds, and the tense political conversations around extended family Thanksgiving tables looks a lot like thinking, but it is actually something else. Jacobs wants to help us do the hard work of thinking. It may well be some of the hardest work we ever do. Thinking can cost you your job, your community, even your life. But in this post I'd like to highlight something else. The book concludes with his helpful "The Thinking Person's Checklist." I'm going to share this checklist with you (or at least the altered-for-brevity version I took down in my notes). Most of these items will make a lot more sense if you go ahead and read the book for yourself, but one particular phrase needs special attention. Jacobs stole the phrase 'Inner Ring' from a lecture CS Lewis gave at King's College, London in 1944. Actually, while you're taking my reading suggestions, go ahead and check out that Lewis lecture too. 1. When faced with provocation to respond to what someone said, give it five minutes. 2. Value learning over debating. Don’t talk for victory. 3. Avoid the people who fan flames. 4. You don’t have to respond to what everyone else is responding to in order to signal your virtue and right-mindedness. 5. If you do, you are not in a community, but an Inner Ring. 6. Gravitate toward people who value real community and can handle disagreement. 7. Seek out the best people you disagree with. Listen to them carefully and think it over. 8. Patiently assess your own repugnances. 9. Sometimes the ick factor is telling, sometimes it’s a distraction from what matters. 10. Beware the power of metaphor and myth. 11. Try to describe other people’s positions in the same words they use. — Alan Jacobs, "The Thinking Person's Checklist"
“What do you do?” we sometimes find ourselves asking perfect strangers. That leads me to think there’s something else that lies beneath the surface here: we can leave the individual and her occupation behind for a moment and look to something deeper, something that all of us as human beings share. What are we supposed to do? What are we here for? Q. 1. What is the chief end of man? As Christians, I think our answer to the question of what we are supposed to do, is that we are supposed to worship. Our vocation as humans is praise. That is not just something that we are supposed to do, it is the main thing that we are supposed to do because it is who we are, or at least it is who we were created to be. Augustine, the fourth century church father, once prayed, “You have made us for Yourself, and our hearts are restless until they find their rest in You.” To be a human being is first and foremost to be called to the activity of worship. Whether we answer that calling, whether we fulfill this our most fundamental vocation is up to us and our perennially restless hearts. And just like any vocation, what really matters here is what you wake up and work at every day, how you organize your time and energy on any given Monday, how prayer and the Scriptures (especially the Psalms) work their way into your routines so that they can, over time, work their way more deeply into your heart. In this way, by God’s grace, in the name of Jesus, and by the power of the Holy Spirit, we are being restored into the kind of creatures we were designed to be – namely, those who worship and praise, those who find their rest in God. So, my friends: What do you do? It is so hard to trust in you sometimes. Our needs and our fears and our anxieties seem so immediate and so real. We worry about having enough money to last us through the month or through our retirement. We worry about what’s happening to our kids and our community and this country and this world that we live in. We worry about bombs and guns, we worry about our jobs and our schoolwork, and we worry about people that we love – and we wonder how we can go on in light of loved ones that we have lost. God, it is so hard to trust you sometimes. Yet you tell us to cast our burdens on you, you tell us to lean not on our own understandings, you tell us to follow you, you tell us that you have overcome the world, you tell us that you are with us even when we walk through the valley of the shadow of death, you tell us your yoke is easy, and you tell us that your burden is light. God, it is so hard to trust you sometimes. But we are a people gathered together in this place because we believe that two thousand years ago you raised a crucified Jewish Rabbi up from the dead. So help us to know your resurrection New Life more intimately, help us to take your power and your grace and your perfect love more seriously than our need and our fear and our anxiety, and help us to lean more intently into your everlasting embrace. In the name of Jesus Christ, and in the power of your Holy Spirit we pray. Amen. This morning a lot of us are tired. We’d like to think that’s just because Daylight Saving Time took an hour of sleep from us last night, but if we’re honest, we’re tired a lot of the time. We’re tired because we give so much of our time to being busy. We’re busy with our jobs, we’re busy with homework and with housework and with hobbies and goals and all kinds of other activities. God, you invented work and creativity and order, and you created us to take part in working and creating and ordering. But you also invented Sabbath rest. Help us to find space in our busy lives to rest so that we can focus on the fact that the value of our lives is not about what we do or what we produce; the value of our life comes from the fact that it is a gift from you. God we are tired and we are busy. Help us to be still so that we can connect more deeply with our families. Help us to be still so that we can be more present in the moment with our friends. We are busy, but you are the God who fights for us; help us to be still and know that you are God.